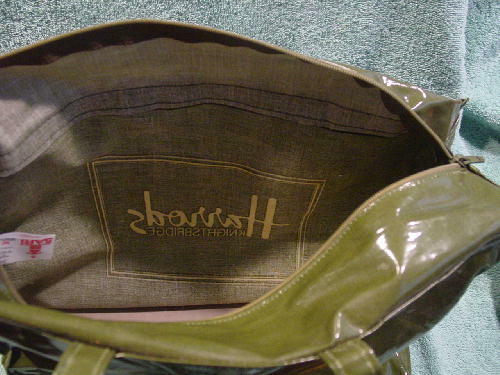 This dark green-olive tote is a Harrods Knightsbridge. It's 55% PVC and 45% cotton and was made by Sari in England. It's unlined and has a hard piece of cardboard on the inside bottom. There is a top side to side zipper and the surface has some tiny white spots where the color is missing. 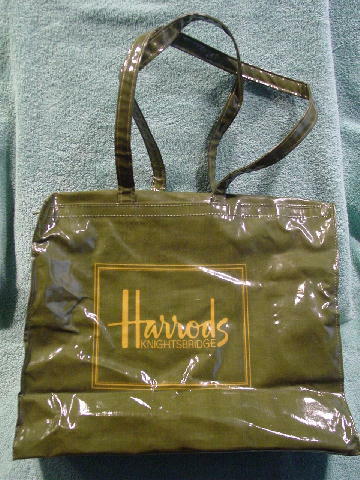 Harrods Knightsbridge and its line border are in a honey color. handles 26 1/2" by 3/4"